THE visitation of the Irish monasteries completed, Columba returned to Iona. But it was no longer as an exile that he left the shores of Erin. This time it was to "Hy of his love, and Hy of his heart" that he was bound—to the country that had become dear to him as the land of his adoption and of his mission; where he had suffered and striven for his Master's sake, and where his work had been blessed beyond all that he had hoped or dreamed. It is especially during the last few years of Columba's life on earth that we can see how the natural fire and arrogance of his nature had been gradually transformed into the gentleness and charity of Christ. It was not without many a struggle that the transformation took place; but Columbcille was a man of great heart and of determined will; what he set himself to do was sure to be done. Now he had set himself—with God's grace—to self-conquest, and the work, though not to be completed in a day nor yet in a year, was at last by dint of prayer and patience gloriously achieved. 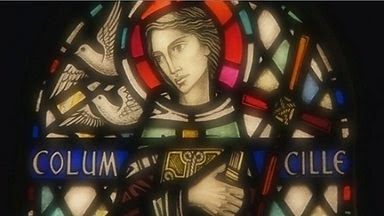 The gentleness of a naturally strong and fiery temperament won—so to speak—at the sword's point, is always an extraordinary force in the world, and we find the power of Columba over his fellow-men and his influence with them for good increasing every year. St. Fintan, one of the Saint's first companions in Iona, was asked once towards the end of Columba's life to describe him to one who had heard much of his holiness, but who did not know him. "He is a king amongst kings," answered Fintan, "a sage amongst wise men, a monk amongst monks. He is poor with God's poor; a mourner with those who weep, and joyful with those who rejoice. Yet amidst all the gifts of nature and of grace that have been so liberally showered on him by God, the true humility of Christ is as royally rooted in his heart as if it were its natural home." He was the father, the brother and the friend of all who were in want or distress; the dauntless champion of the oppressed and of the weak, the avenger of all who suffered wrong. His prayers and blessing were sought by all the navigators of the stormy seas of the Hebrides as a defence against the dangers of the deep; while during his journeys on the mainland the people would bring out their sick and lay them in his path, that they might touch the hem of his cloak or receive his benediction as he passed. Their simple faith was not in vain: many were the miraculous cures wrought by the Saint, whose prayers were as powerful with God as those of St. Peter and St. John, and with whom he might have said "silver and gold I have none, but what I have I give thee." He would visit rich and poor alike, and it was often in the houses of the latter that he met with the truest hospitality. He would find out with gentle tact what were the means of his humble hosts, and plan ways of increasing their little store. Once when he was passing through Lochaber on his way to visit King Bruidh in his royal palace, he was offered a lodging in the house of a poor peasant and kindly entertained with the best that the poverty of the house could furnish. In the morning when the little Highland cows of his host were being driven out to pasture, Columbcille blessed them, and foretold that they would increase until in course of time they would number five hundred, and that the blessing of a grateful traveller would rest upon the man and his family. Columba took an observant interest in all the things of nature, and was often able to advise the peasants how to improve the simple methods of farming, hunting, and fishing on which their daily food depended. On one occasion he profited by the hospitality shown to him by a rich Highland chief to put an end to a deadly feud which in true Highland fashion had existed for many years between his host and one of his neighbours. The enemies were reconciled, and both became fast friends of the peacemaker. Tender-hearted as Columba was to all who were in sorrow and distress, to none did his ready sympathy extend more fully than to those who were exiles from their native land, for he remembered the early days of his own sojourn in Iona. One of his special friends was a Pictish chief of noble birth who had received him on the occasion of his first missionary journey to Caledonia and treated him with generous hospitality. Some time after he fell into disgrace and was banished from the country. Columba appealed in his favour to Feradagh, the chief of the island of Islay, whom he begged to give shelter and protection to the exile, while he tried what his influence could do with the Pictish king to obtain his friend's recall. Feradagh, after promising hospitality to the fugitive, murdered him treacherously for the sake of his possessions. The news was brought to Columbcille, who cried out in indignation that the punishment of God would overtake the traitor before he had tasted of the flesh of the boars that he was fattening for his table. Feradagh laughed at the threat but was not a little uneasy, for he had heard of the strange way in which Columba's prophecies were wont to come true. He had a boar killed without loss of time and roasted, in order to reassure himself that this time at least the Saint had been wrong. As he sat down to table, he fell down from his seat and died, to the fear and consternation of his followers. A certain chief named Donnell, who with his sons and followers feared neither God nor man, was the terror of all the neighbouring country. Although he could claim kinship with the King of Dalriada, Columba excommunicated him for his deeds of violence, and he and his family vowed vengeance on the Saint. Taking advantage of a journey that Columba was making to a neighbouring island with only one or two companions, one of the sons of Donnell resolved to murder him as he slept. But one of Columbcille's companions, a monk named Finn Lugh, was beset that night with an unaccountable fear for the safety of his holy abbot, and begged him to lend him his cowl, in which he wrapped himself and lay down to sleep. In the dead of night the assassin crept upon the little band of travellers, and, seeking out the monk who wore the abbot's cowl, stabbed him, and fled to a place of safety. But the garment of the Saint protected the man who was ready to give his life for his master, and Finn Lugh escaped without a wound. Another lawless member of the same family fell upon and robbed a man who lived upon the rocky peninsula of Ardnamurchan, and had constantly shown hospitality to Columba on his journeys. The blessing of the Saint had brought him good fortune, and his little patrimony had increased year by year. The people, in honour of the affection shown him by the holy abbot, called him "Columbain" or "the friend of Columba." As the robber was returning, laden with the spoils of the poor man, to the boat that was awaiting him at the water's edge, he met Columba himself, whom he had supposed to be safely distant at Iona. The Saint reproved him sternly for his crimes, and bade him restore the goods that he had stolen. The robber chief maintained a grim silence until he was safely in his boat and well out from the shore. Then he stood up, and bursting into a storm of insults and evil words, shouted defiance and derision at Columbcille as long as his voice could be heard. The oppression of the helpless never failed to rouse Columba's wrath. He strode out into the water after the retreating boat, and, raising his arms to heaven, prayed that justice might be done on the robber. Then returning quietly to his companions he said to them, "That wicked man who despises Christ in His poor will return no more to these shores. The cup of his iniquity is full." Shortly afterwards a storm arose, and the boat with all that were in it sank like a stone between Mull and Colonsay. But it was not only to the poor and the oppressed that Columba's charity was shown. We find him at the Court of King Aidan, holding his young son Hector "the Blond" in his arms and praying that his life might be as fair as his features. To the nobles who kept the laws of God he was as devoted a friend as he was a steadfast opponent of those who outraged them. To the penitent he was full of mercy and hope, and many sinners were persuaded by his eloquence and power to forsake their evil ways. But nowhere was his charity more clearly shown than with his own community at Iona. He foresaw the needs of all, and watched over his spiritual sons with a fatherly love and care. During one of the last summers of his life when the monks were coming back in the evening after a day of harvesting, they stopped short at a little distance from the monastery to enjoy the sense of peace and consolation that seemed to come to meet them as they approached their home. "How is it," asked one of the younger brethren, "that at this spot every night when we return from our daily labours, our hearts rejoice, our burdens grow light, and the very perfume of heaven seems borne to us on the breeze?" "I will tell you," said Baithen, the beloved friend and successor of Columba. "Our saintly abbot, whose heart is with us in our work, is praying for us and longing for our safe return. His heart is heavy with our weariness, and, having no longer the strength to come in the body to meet us and help us with our burdens, he sends forth the blessing and the prayer of his soul to refresh and console us on our way." Not only his fellow-men but all the creatures of God were dear to Columba for their Creator's sake. One day he bade a certain monk at Iona go down to the seashore and watch. "For," said the Saint, "ere the night falls a weary guest will arrive to us from Ireland, faint and ready to die. Succour her and tend her carefully for three days, and when she is rested and refreshed let her go, that she may return once more to her native land." The guest was a poor storm-driven crane which fell on the shore exhausted at the brother's feet. He bore it tenderly to the monastery and cared for it as his master had bidden. In the evening Columba met the monk and blessed him for his compassion to the weary stranger; and, as he had foretold, on the third day, strengthened and refreshed the bird took its flight back to Erin.